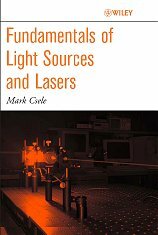 The author of this page is also the author of 'Fundamentals of Light Sources and Lasers' published by Wiley in July of 2004 (ISBN 0-471-47660-9). Focussing primarily on lasers, the text introduces background concepts necessary to understand lasers including the nature of light itself, blackbody radiation and atomic emission, as well as basic quantum mechanics. Lasers are covered in detail with practical, real-world examples found throughout. The last six chapters of the text outline various laser systems in detail including visible, UV, and IR gas lasers, semiconductor lasers, solid-state lasers, and tunable dye lasers. WARNING: Construction and operation of any laser device is hazardous. Do not attempt to construct or operate a laser without adequate safeguards and safety practices. Most lasers involve high voltages, toxic chemicals, high vacuum, laser radiation and other hazards. The author specifically disclaims any and all liabilities associated with the construction and use of such devices. Designs presented here are in the interests of providing information on operational principles only and do not represent safe nor ANSI safety compliant designs. Now I don't want to discourage anyone from attempting to build their own laser but to be honest lasers, in general, are touchy devices to construct. Some types of lasers are simply too expensive or too complex for many amateurs to build. Building a CW Argon laser, for example, requires obtaining expensive dielectric mirrors as well as a high vacuum system incorporating a diffusion or turbomolecular pump (since operating pressures are in the millitorr range). As well, the power supply must supply up to 25A of regulated current continually and the tube itself must be made from exotic materials (e.g. Beryllium oxide) to withstand the intense heat generated during operation. Although it can be done, the cost of producing such a laser "from scratch" would likely be prohibitive for most amateurs. In the case of this laser, surplus tubes can likely be purchased for less than the cost of the optics alone! This does not necessarily preclude the 'from scratch' construction of a pulsed argon laser though which is considerably less demanding to construct (although certain elements of the laser such as a high vacuum system are still required). Another popular laser for amateur construction is the carbon dioxide (CO2) laser of which there are numerous accounts of homebuilt units on the web, but expect to shell out about $500 ($200 + for the mirrors alone) if you intend to go that route! On the flipside, there are many types of lasers which CAN be constructed reasonably easily and inexpensively (in the hundred dollar range or less) by the amateur with a reasonable expectation of success. Some are constructed completely 'from scratch' using materials available at a hardware store, while others are adapted from parts scavenged from surplus commercial laser systems. It is these types of lasers that this site will focus on. We begin by examining a few reasonable possibilities for homebrew constructors. Lets be honest ... if you've got unlimited cash (and hence resources) there's almost no limit to what you can do (go for the CW argon:), but if you're trying to keep your laser project to a tight budget your choices are somewhat more limited! Diode and Helium-Neon (HeNe) lasers which usually produce a CW red beam. A diode laser requires only a simple power supply such as a simple current regulator (easily built from a regulator chip). The cheapest source for laser diodes are inexpensive laser pointers from a dollar store. Aside from a diode laser, perhaps the best 'first-project' for a hobbyist is the HeNe gas laser. A good start for the beginner, working with this laser will provide valuable experience at working with high voltages. Tubes and power supplies are available on the web from various surplus suppliers from $25 and up. For powering a HeNe laser tube all that is usually required is a suitable high-voltage power supply which can be purchased as a packaged, epoxy-encapsulated unit, or can be built by the hobbyist from individual components. Nitrogen lasers produce intense pulses of UV light. Aside from uses in stimulating fluorescence in materials this laser is commonly used as a pump laser for dye lasers. It is easily constructed from materials available at most hardware stores. Only a basic vacuum pump is required so even a converted refrigerator compressor can be used and a well-constructed laser can use air as the lasant gas saving the cost of a tank of gas. TEA Nitrogen lasers are similar to the nitrogen above however do not require a vacuum pump at all. These lasers have incredibly short output pulses (about one nanosecond) and so construction of the electrical discharge circuit is _very_ critical. No vacuum pump is required making it attractive to many amateurs however the pulse is extremely short and these are 'touchy' to construct. A good choice only after you understand basic electronics and the principles behind a transmission line. Dye lasers are relatively easily constructed which use a nitrogen laser as a pump. These are fully tunable across large ranges of wavelengths by using a diffraction grating instead of a fully-reflecting rear mirror. Flashlamp Pumped Dye lasers are a bit more difficult to build than a nitrogen-laser pumped dye laser since the flashlamp must operate in about one microsecond: 1000 times faster than a common photoflash strobe. Still, a decent choice for amateur construction especially if the discharge is optimized for speed by using higher voltages and lower capacitances. Again, a good understanding about the concepts of impedance and discharge circuits is required. Nd:YAG and Ruby lasers emit powerful pulses capable of burning. The main issue here is availability (and affordability) of the laser rod and mirrors although these are frequently available on the surplus market opening the door to higher powers. YAG has low pump threshold energies allowing small (< 100J) flashlamps to be used. DPSS Diode-pumped solid-state lasers range in size from small handheld green laser pointers to large systems with over 100W of visible output. Inexpensive diodes, often at 808nm, pump a neodymium laser (vanadate or YAG) oscillating at 1064nm which is then frequency doubled to 532nm. Argon lasers emit powerful green and blue beams. Air-cooled tubes, resembling overgrown HeNe tubes, are available on surplus markets to make this laser viable for amateurs. The power supplies are more complex than HeNe's though given the high currents involved and since commercial power supplies are in short supply many amateurs opt to build their own. Other lasers such as a veriety of gas lasers either built from scratch or using old HeNe and argon tubes are possible (e.g. Pure neon, which can be used in an old HeNe tube with suitable power supply, has emissions in the yellow, orange, and green). Another possibility is the Copper-vapour laser. This high-gain laser produces green and yellow beams - the tricky part is designing a laser tube which operates at the high temperatures required for the vapour. If you read the old Amateur Scientist articles you might wonder why the majority of homebuilt lasers, especially where the tubes are fabricated from scratch, are pulsed? The answer is both in the gain and excitation mechanism of the laser. High gain lasers, such as the nitrogen laser, are quite forgiving for amateur construction. Having high gains, the mirrors on these lasers may be inexpensive aluminum mirrors or in some cases a single-pass through the laser tube is all that is required so no mirrors are required at all (superradiance)! Generally, CW lasers (many gas lasers such as the HeNe) have low gains so special dielectric mirrors are required which reflect in excess of 99% of incident light (aluminum reflects only about 80% of incident light at the best of times). This may increase the cost and complexity beyond the reach of most amateurs unless one is creative in extracting optical components from old lasers (e.g. using the cavity mirrors from old surplus lasers in a new design). Old HeNe and Argon lasers will often yield optics which will work with a completely different type of laser - I _never_ throw out an old laser without first stripping the cavity mirrors which may lend themselves to other laser projects. A further reason is one of cooling and power issues. While a HeNe laser typically runs at 1500V at 5mA (and in doing so the discharge tube dissipates only 7.5 Watts), even the smallest CW argon tubes dissipate 1 KILOWATT of heat! Such power levels dictate a large power supply and a cooling system. If that same argon laser was built as a pulsed unit running at a rate of 120Hz with 10ms pulses, the power dissipated is only 1 watt so that no cooling system is required and the power supply is relatively simple. I might add that a CW argon laser tube requires exotic materials to withstand the extreme heat produced in the discharge while a pulsed laser can utilize ordinary glass construction which is within reach of the budget of most amateurs. A similar issue exists with the YAG laser: while one can use CW arc lamps to build a CW YAG laser, an elaborate cooling system is required as well as a LARGE (8KW) power supply. The same laser, built using a pulse flashlamp, requires only a small power supply to operate and simple convection cooling (this is illustrated on the YAG laser page). As simple as they look, many of the lasers described here are critical with respect to the design of the pumping mechanism and require fast energy pumps to operate. Consider the nitrogen laser which requires that energy be dumped into the laser tube within nanoseconds (the output pulse usually lasts about 10 nS) or the flashlamp-pumped dye laser which requires a flashlamp which has rise times of less than one microsecond. These parameters are dictated by the energy level parameters of the lasing medium. In the case of the nitrogen laser, a fast pulse is required to ensure the upper-lasing energy state fills first and builds to a sufficient population over that of the lower-lasing level (i.e. inversion occurs). A slow discharge (i.e. slow pump) allows population in the upper-lasing level to decay to the lower-level quicker than it builds-up so that population inversion, required for laser action, will not occur. The problem here is one of lifetime of the energy levels - the lower level has a much longer lifetime than the upper level so any pumping mechanism must fill the upper level quickly! This is a simplified view of how these lasers work but it illustrates the point. If you're looking for a simple entry into the hobby of amateur laser construction a HeNe or diode laser is an inexpensive and easy way. HeNe tubes and visible laser diodes may be purchased for under $25. For those who are looking to construct their own laser 'from scratch' a nitrogen and/or dye laser can be constructed with reasonable ease and cost. Some of the 'other' lasers I've mentioned such as Nd:YAG/Ruby can also be constructed easily but may cost a few dollars more since one must purchase the rod and mirrors (unless you find a deal on the surplus market). My personal suggestion? Start with a HeNe laser to gain experience with high voltage work. The completed HeNe is also a valuable tool when aligning other lasers (I still use a HeNe to align large YAG and CO2lasers). For a 'from scratch' laser the nitrogen/laser-pumped dye laser is a good option. The nitrogen laser is easy to construct and very forgiving. With careful selection of parts (no cheating by using thick PCB) it is almost guaranteed to operate well. A laser-pumped dye laser is also easy to construct and the gain is very high allowing either superradiant operation or use of inexpensive aluminum mirrors. This eases matters greatly since optics and alignment are no longer critical. See the Dye Laser page on this site for details. If anyone has alternative, easy, designs for various lasers I'd be interested in hearing from you (as will many amateurs I'm sure). Are kits or plans available from you for a laser ? No. All of my lasers were built from designs synthesized from other designs. The 'fun' of constructing a homebuilt laser (to me at least) is in engineering and adapting the design to use readily available materials. As an example consider my original nitrogen laser which used a piece of black ABS sewer pipe for a vacuum enclosure. I suggest you begin by looking in the Scientific American Amateur Scientist column (see the LINKS page on this site) for ideas. After that, a search of some of the references mentioned on the various pages (journal articles, such as those from Applied Physics Letters, etc.) will go a long way to explaining the methodology of a particular design. Why did you write this site ? I teach laser engineering at Niagara College in Canada but my fascination with these devices began _way_ before that. When I was in grade school I had attempted to construct many lasers, most without success. In those days, there simply wasn't a lot of information available to me outside of Scientific American Amateur Scientist articles (which I still advocate for amateurs and my students alike). Later I discovered journals in a local University library which helped immensely. Having put a single-page on the web back in 1997 describing my original N2 laser design I was amazed at the interest (and e-mails) generated! I began adding pages describing these laser designs in more detail until it became what it is today (a site which is still growing). The original intent of this site was to act as a resource for those planning such a project. Not by offering complete plans (and certainly not by charging $25 each for them :), but by demonstrating some basic designs that might help amateurs in synthesizing their own designs. I enjoy receiving e-mails detailing amateur-built lasers which uses some unique design. Recently, this site has migrated towards a resource for several courses I teach, namely PHTN1400 (Principles of Laser Systems) and PHTN1432 (Vacuum Systems and Thin-Film Technology). I firmly believe the best way to understand how a particular laser works is to examine the mechanism behind the laser. Can you help me build a CO2 Laser ? No. This site outlines various lasers I have first-hand experiences with and presents construction details for those lasers. While I have built HeNe, Nitrogen, Dye, and several other lasers 'from scratch', I have never built a CO2 so I can't help there! I have rebuilt and maintained such lasers, but never built one so I'd suggest you check other sites on the web (check the LINKS page). Can you build a laser for me ? No. I'm a professor and really don't have time to fabricate equipment for other parties. Where do I look for science fair project ideas using lasers ? I have a basic page on this site devoted to science fair ideas but first, check the Amateur Scientist column from Scientific American magazine. The best way is the searchable CD-ROM collection available from a link on my LINKS page. When I was building projects this was my primary resource for ideas! I had to remove the clickable link due to the amount of spam I have been receiving. Because of my anti-spam filter, please refer to 'LASERS' or something else meaningful on the subject line (E-mail without a subject or with a vague subject like 'You Won' will be automatically deleted). The Page Hosted On the Niagara College Technology Server. A SUN machine running UNIX. Regarding COPYRIGHTS: Portions of this site copyrighted � 2004 by M.Csele, Niagara College, John Wiley and Sons publishers, and various entities. Licensing agreements may apply to some portions of the site. The author takes credit for text and diagrams unless otherwise noted - efforts have been made to cite sources for references where possible.